Acrylic paints are a wonderful thing. Not only are they inexpensive, they also hold up to the outdoor elements surprisingly well. I've lost count how many times I've picked up garage sale items others have given up on, just to repaint them for probably less than a dollar. You never know what I might paint! Great jobs. Is that bench a mini or can you sit on it? Either way it's adorable. Gosh that bench is really lovely Pianolady. I'd be proud to have it in my own garden any day. Wish I had your imagination and your painting skills. It's just a mini-bench, I picked it up at a garage sale in sad shape. 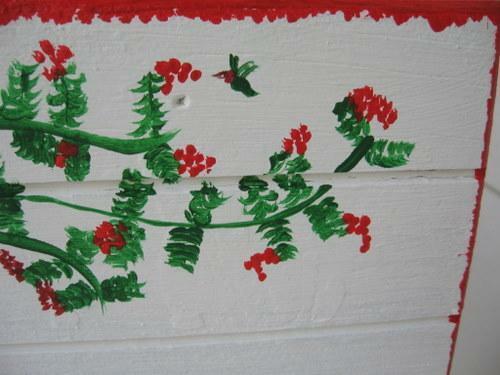 The trellis is just a plain one bought at any home improvement store, and painted white to match the shed. 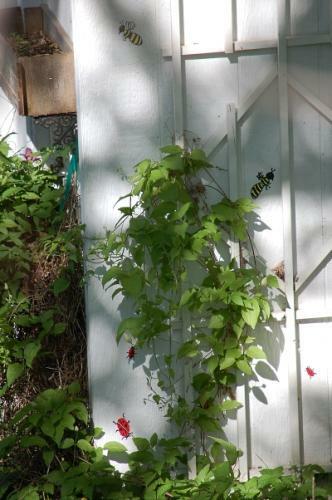 If you put in spacers between the trellis and the shed on the back side, it will make it easier for the vines to climb the trellis. 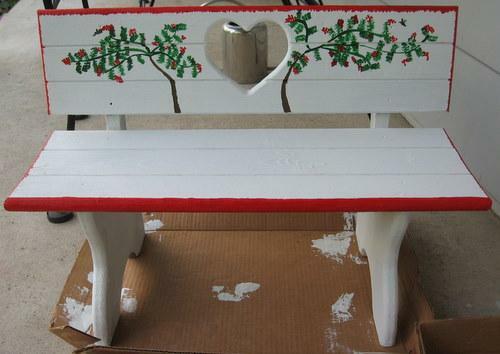 Just love the bench. Great job. You really did a job on that bench. Just more inspiration I get from the stew!